How is your company responding to the pressure to minimize operational costs? 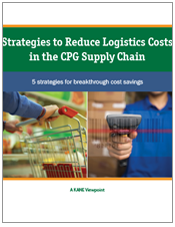 Kane's white paper, "CPG Logistics," provides 5 strategies to help mid-sized CPG manufacturers cut warehousing and freight costs while improving retailer scorecards. The paper draws on decades of experience assisting middle-market companies with warehousing, chargeback reduction, packaging and other logistics support.